Have you ever had problems keeping up with your Wing Chun workout while away from home or while dealing with a schedule variance that causes you to miss classes? It’s almost inevitable for people working and living in the modern economy. If is has happened to you, then you know how it can really screw up your routine. Luckily there are accessories like the Wing Chun Attachmate and ProForce Strong Arm that might be able to help you. They are definitely worth consideration. 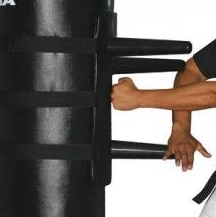 If you don’t know what the Attachmate or Strong Arm are, they’re basically items that turn a heavy bag or punching bag into a mock wooden dummy. Each accessory consists of dummy arms that are connected by straps. You use the straps to join the Attachment or Strong Arm to a heavy bag, which acts as the trunk of the dummy. They first very clear benefit is that if you don’t have access to a dummy but you do have access to a heavy bag then you can use a Wing Chun attachment to get some practice time logged. It’s much easier to find a heavy bag when on the road than it is to find a spare Wing Chun dummy. These things are also extremely lightweight. It makes them a breeze to carry around. They pack easily and since it’s made of plastic-like materials you usually won’t run into any problems if you pack this in your carry on luggage when traveling by air. This mock dummy can be useful for a few different types of people. For newer students who have a heavy bag but do not have a lot of extra money to invest in a real dummy, this is a great option. It’s also good for travelers or people who spend a lot of time working on the road. It’s also great for teachers who travel to private lessons due to its portability. It should be obvious but if you haven’t figured it out yet, these are not a real wooden dummy. While they are cheap portable, and versatile, they have some drawbacks as well, T]he biggest problem with a mock dummy accessory is that it’s not nearly as rigid as the real thing. No matter how well you secure it to a punching bag, the arms and leg just aren’t as secure as those on a wooden dummy. Another issue is that while being made of plastic materials makes it light and easy to transport, it also makes it less of a solid target. Pounding your forearm into a wobbly plastic post is an incredibly different feeling than doing so with a securely positioned wooden post. Since the Attachmate and Strong Arm are actually attached to a heavy bag, if your bag is the traditional ceiling mounting type, then it will move and swing. The movement is usually very minimal, but it’s something to be aware of. 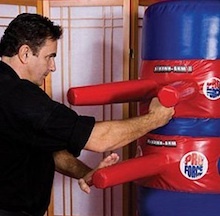 The Wing Chun Attachmate and the ProForce version are not a full-time replacements for a kung fu dummy. Both are something that you can use as you are traveling or while deciding if you want to go ahead full steam and get a real wooden dummy. If you purchase one with that in mind, than it’s definitely useful and worth the money.